when equipped with the Slant-Six engine. The V-8 added $143 to the bill. Barracuda bowed to the Canadian public on April 1, 1964 as a sub-series of the Valiant brand. 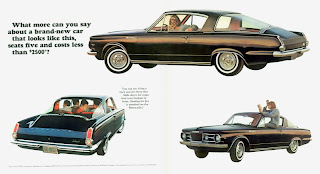 The snazzy Chryco product shared sheet metal with the Valiant below the beltline but this stylish set of wheels was topped with a glassed-in fastback roof that boasted a 14.4-square foot rear window. The carpeted trunk expanded into a large cargo area because the rear seat could be dropped flat. Barracuda's grille was borrowed from the Dodge Dart (not sold in Canada). The car was powered by the 101-horsepower Slant-Six. The Valiant Barracuda was intended to do battle with the Rambler Marlin and the Ford Mustang. There were no breakouts for sales but Barracuda was one of 34,802 Valiants sold in Canada that year. It was the Number Four best selling automobile in the country—right behind the full-sized Fords and just a whisper ahead of the trend-setting Rambler. Barracuda returned in 1965 with a 273-cubic inch V-8 engine to move it along faster. With sales figures still part of the Valiant family, the year ended with 32,441 units delivered. In its third year on the market, The Barracuda was given its own sales slot. It ranked 55th among nameplates on the domestic market, with 1,381 units delivered. It was less popular than Peugeot, in 54th place, and slightly more popular than Triumph in 56th position. Valiant would have been sixth with Barracuda figures added in but Plymouth’s compact make dropped to ninth place with the separation of the two nameplates. and weighed in at 2,720 pounds with a Slant-Six under the hood. For 1967 there was a major restyle for Valiant and Barracuda. That wasn't the only change chez Valiant. There were no more Canada-only Valiant Barracudas. Signed in 1965 by Canada and the United States, AutoPact meant free trade for the continental automotive industry. There was no more need for “homegrown” cars for our significantly smaller market. Plymouth Valiants and Plymouth Barracudas were now imported into Canada without tariff or tax. Executives also decided to cut Barracuda loose from the Valiant family in terms of body style. Whereas the Valiant was angular and almost boxy, the new sporty car was lithe and speedy looking. It flowed and curved in all the right places. A convertible and hardtop were added to the lineup. The stunning restyle caused Barracuda to leap a full ten positions into 45th place with 3,813 sales recorded. 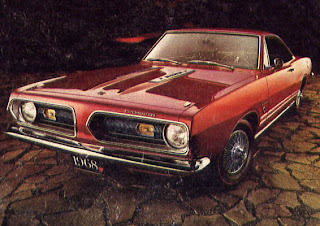 When it was time to roll out the red carpet for the 1968 models, there were few changes for the Barracuda. Like every other automobile on the market, it received side-markers, four-way flashers and dual-brake systems as mandated by Transport Canada. Barracuda got an optional 340 V-8 to stuff under the hood. To differentiate the 1968 lineup from previous models there were slight changes to the grille, taillights and a trim shuffle. The hardtop lost its concave glass. Only a handful of Barracuda ragtops were sold in this country in 1968. Records show that Newfoundlanders bought more convertibles per capita than in any other province. The convertible’s price tag was $3,620 with the V-8 engine installed. Having said all that, ad copy was quick to cover all the bases and point out that the Barracuda was just as much at home at beach parties and deb parties as it was church socials, wedding receptions and the corner grocery store. Barracudas swam off the line in Hamtramck, Michigan in a wide range of colours including Ember Gold Metallic, Mist Turquoise Metallic, Surf Turquoise Metallic, Turbine Bronze #2 Metallic, Matador Red, Electric Blue Metallic, Burgundy Metallic, Sunfire Yellow, Avocado Green Metallic, Frost Blue Metallic, Sable White, Satin Beige and Sierra Tan Metallic. 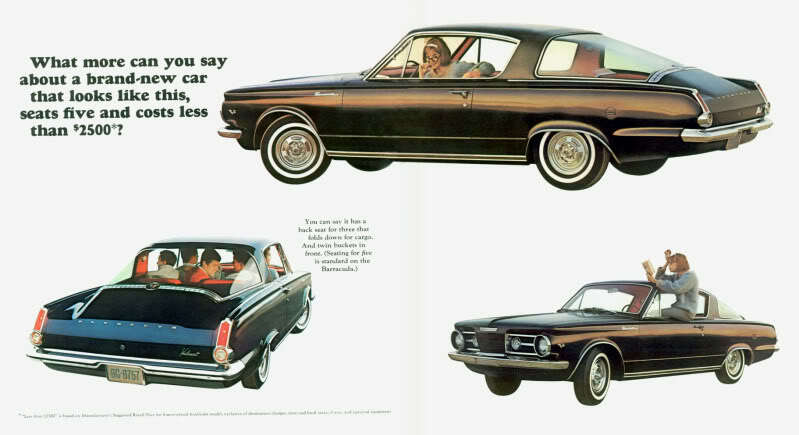 It was a good year for Chrysler Canada's Plymouth Division in general and Barracuda in particular. It held on to 45th place with sales of 3,004 units. The 1968 Barracuda fastback was the most popular model with Canadian consumers, selling for $3,423 when ordered with the V-8 engine.